Bhubaneswar:31/10/18 Thousands of people participated in the ‘Run For Unity’ Marathon organized in Bhubaneswar to pay tribute to Sardar Vallabhbhai Patel on the occasion of his 143rd birth anniversary on Wednesday. 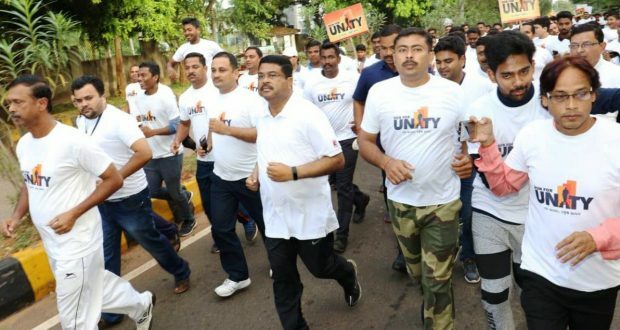 The ‘Run For Unity’ Marathon was flagged off by Union Petroleum Minister Dharmendra Pradhan from the Rail Auditorium at Chandrasekharpur in Bhubaneswar. The Minister along with the participants took an oath to dedicate them to protect the unity and integrity of the nation and try their best to spread the message among people of the country. “Proud to be a part of Run For Unity on Rashtriya Ekta Diwas to commemorate the birth anniversary of Sardar Vallabhbhai Patel, the Iron Man’ of India. Delighted to see the people of Bhubaneswar turning out in large numbers to pay their tributes to the architect of modern India,” tweeted Pradhan. “The visionary leadership of Sardar Vallabhbhai Patel, the First Deputy PM & Home Minister of India, and efforts of mass leader Dr Harekrushna Mahatab and Pabitra Mohan Pradhan ensured the merger of 25 princely states in Odisha. Sardar Patel’s contribution for Odisha is incomparable,” said the Minister. Chief Minister Naveen Patnaik also paid his tribute to the Iron Man of India. “His contribution to integrate India into a powerful nation will always be remembered,” said Patnaik.